The Book of Common Prayer has only two fast days, Ash Wednesday and Good Friday. It also asks us to observe “by special acts of discipline and self-denial” each Friday through the year and the weekdays of Lent. 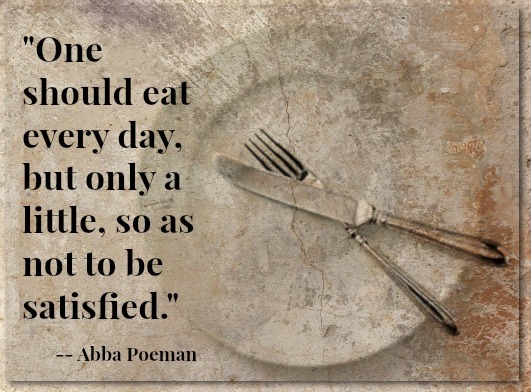 With this in mind we often ask and are asked, “What are you giving up for Lent?” Neither the Book of Common Prayer nor Abba Poeman tells us what to fast from or how much. There is wisdom in that restraint. It seems Abba Poeman is more interested in fasting as a means and not as the goal. Fasting has a purpose beyond not eating. For Abba Poeman that purpose is to restore balance and moderation. Food is not the enemy, excess is. Abba Poeman is asking Abba Joseph to examine and be discerning about his life. Abba Poeman gives two hints about this discernment: “so as not to be satisfied” and “but just a small amount.” Abba Poeman wants Abba Joseph to feel and experience his hunger. Consider in what ways food is sometimes used to satisfy and hide some of our deeper hungers; for companionship, for entertainment, for meaning, and significance. What are you really hungry for? Where is there excess in your life? This question is not just about food but all the many things and ways we use to make ourselves full and satisfied. What parts of your life are out of balance? Where is moderation needed? What would restore balance? Fasting, special acts of discipline, and self-denial do not have to be huge undertakings. Small, simple, and doable acts may bring us to greater awareness of our life and relationships than something large that can easily become the focus of our attention. Forego the second cup of coffee or glass of wine. Fast from bread or meat. Interrupt the usual patterns of eating. Skip the evening snack, refuse seconds, or take only a half portion. Let yourself feel hungry, and allow that hunger to point you toward the fact that our deepest hunger is from and for God. Being cognizant of and reasonable about your medical conditions and needs, regularly fast from a meal. Remember the hungry in your prayers, and donate the cost of the meal to your local food pantry. Blessed are you, Lord our God, King of the Universe, who brings forth bread from the earth and living bread from heaven. Grant me the grace of a holy hunger in both body and soul. Keep me mindful of the needs of others. Let me find my hunger satisfied in you. All this I ask with thanksgiving, in name of our Lord Jesus Christ who, with you and the Holy Sprit, lives and reigns, one God, now and forever. Amen. March 27 – Fasting From Words. 1. Poeman 31 in The Sayings of the Desert Fathers, The Alphabetical Collection, trans. Benedict Ward (Kalamazoo, MI: Cistercian Publications, 1984), 31.